"Al-jabr" redirects here. For other uses, see Jaber (disambiguation). The Compendious Book on Calculation by Completion and Balancing (Arabic: الكتاب المختصر في حساب الجبر والمقابلة‎, Al-kitāb al-mukhtaṣar fī ḥisāb al-ğabr wa’l-muqābala; Latin: Liber Algebræ et Almucabola) is an Arabic treatise on mathematics written by Persian polymath Muḥammad ibn Mūsā al-Khwārizmī around 820 CE while he was in the Abbasid capital of Baghdad, modern-day Iraq. Translated into Latin by Robert of Chester in 1145, it was used until the sixteenth century as the principal mathematical textbook of European universities. It also introduced the term "algebra" (الجبر, al-jabr) to European languages. The Compendious Book provided an exhaustive account of solving for the positive roots of polynomial equations up to the second degree. Several authors have also published texts under this name, including Abū Ḥanīfa al-Dīnawarī, Abū Kāmil Shujā ibn Aslam, Abū Muḥammad al-ʿAdlī, Abū Yūsuf al-Miṣṣīṣī, 'Abd al-Hamīd ibn Turk, Sind ibn ʿAlī, Sahl ibn Bišr, and Šarafaddīn al-Ṭūsī. 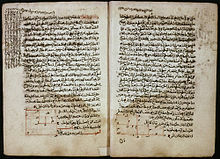 Al-Khwarizmi's text can be seen to be distinct not only from the Babylonian tablets, but also from the Diophantus' Arithmetica. It no longer concerns a series of problems to be resolved, but an exposition which starts with primitive terms in which the combinations must give all possible prototypes for equations, which henceforward explicitly constitute the true object of study. On the other hand, the idea of an equation for its own sake appears from the beginning and, one could say, in a generic manner, insofar as it does not simply emerge in the course of solving a problem, but is specifically called on to define an infinite class of problems. The book was a compilation and extension of known rules for solving quadratic equations and for some other problems, and considered to be the foundation of algebra, establishing it as an independent discipline. The word algebra is derived from the name of one of the basic operations with equations described in this book, following its Latin translation by Robert of Chester. 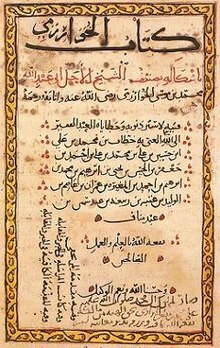 Since the book does not give any citations to previous authors, it is not clearly known what earlier works were used by al-Khwarizmi, and modern mathematical historians put forth opinions based on the textual analysis of the book and the overall body of knowledge of the contemporary Muslim world. There are indications of connections with Indian mathematics, as he had written a book entitled The Book of Bringing Together and Separating According to the Hindu Calculation (Kitāb al-Jamʿ wa-l-tafrīq bi-ḥisāb al-Hind), discussing the Hindu-Arabic numeral system. ... the algebra of al-Khwarizmi is thoroughly rhetorical, with none of the syncopation (see History of algebra) found in the Greek Arithmetica or in Brahmagupta's work. Even the numbers were written out in words rather than symbols! Islamic mathematicians, unlike the Hindus, did not deal with negative numbers at all; hence an equation like bx + c = 0 does not appear in the classification, because it has no positive solutions if all the coefficients are positive. Similarly equation types 4, 5 and 6, which look equivalent to the modern eye, were distinguished because the coefficients must all be positive. The al-ğabr ("forcing", "restoring") operation is moving a deficient quantity from one side of the equation to the other side. In an al-Khwarizmi's example (in modern notation), "x2 = 40x − 4x2" is transformed by al-ğabr into "5x2 = 40x". Repeated application of this rule eliminates negative quantities from calculations. Al-Muqabala (المقابله, "balancing" or "corresponding") means subtraction of the same positive quantity from both sides: "x2 + 5 = 40x + 4x2" is turned into "5 = 40x + 3x2". Repeated application of this rule makes quantities of each type ("square"/"root"/"number") appear in the equation at most once, which helps to see that there are only 6 basic solvable types of the problem, when restricted to positive coefficients and solutions. Subsequent parts of the book do not rely on solving quadratic equations. The second chapter of the book catalogues methods of finding area and volume. These include approximations of pi (π), given three ways, as 3 1/7, √10, and 62832/20000. This latter approximation, equalling 3.1416, earlier appeared in the Indian Āryabhaṭīya (499 CE). Al-Khwārizmī explicates the Jewish calendar and the 19-year cycle described by the convergence of lunar months and solar years. About half of the book deals with Islamic rules of inheritance, which are complex and require skill in first-order algebraic equations. ^ The Arabic title is sometimes condensed to Hisab al-jabr w’al-muqabala or Kitab al-Jabr wa-l-Muqabala or given under other transliterations. ^ Philip Khuri Hitti (2002). History of the Arabs. p. 379. ^ "Islam Spain and the history of technology". www.sjsu.edu. Retrieved 24 January 2018. ^ Boyer, Carl B. (1991). "The Arabic Hegemony". A History of Mathematics (Second ed.). John Wiley & Sons, Inc. p. 228. ISBN 0-471-54397-7. The Arabs in general loved a good clear argument from premise to conclusion, as well as systematic organization – respects in which neither Diophantus nor the Hindus excelled. ^ Rashed, R.; Armstrong, Angela (1994). The Development of Arabic Mathematics. Springer. pp. 11–2. ISBN 0-7923-2565-6. OCLC 29181926. ^ Robert of Chester (1915). Algebra of al-Khowarizmi. Macmillan. ^ David A. King (2003). "Mathematics applied to aspects of religious ritual in Islam". In I. Grattan-Guinness (ed.). Companion Encyclopedia of the History and Philosophy of the Mathematical Sciences. 1. JHU Press. p. 83. Boyer, Carl B. (1991). "The Arabic Hegemony". A History of Mathematics (Second ed.). John Wiley & Sons, Inc. ISBN 0-471-54397-7. Annotated excerpt from a translation of the Compendious Book. University of Duisburg-Essen. Ghani, Mahbub (5 January 2007). "The Science of Restoring and Balancing – The Science of Algebra". Muslim Heritage.